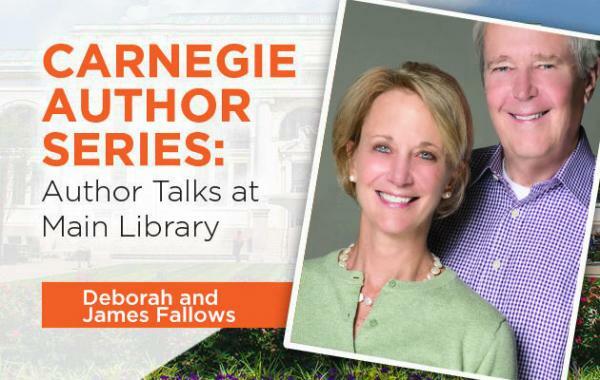 Check out books on our catalog by James Fallows and Deborah Fallows. The Friends of the Library will sell a selection of the authors' books near the book signing table, or you can bring your personal copy to have signed. For five years starting in 2013, Deborah and James Fallows traveled across America in a single-engine prop airplane. Visiting dozens of towns (including Columbus), they met hundreds of civic leaders, workers, immigrants, educators, environmentalists, artists, public servants, librarians, business people, city planners, students and entrepreneurs to take the pulse and understand the prospects of places that usually draw notice only after a disaster or during a political campaign. The Fallowses describe America in the middle of one of these creative waves. Their view of the country is as complex and contradictory as America itself, but it also reflects the energy, the generosity and compassion, the dreams and the determination of many who are in the midst of making things better. Our Towns, published in 2018, is the story of their journey and an account of a country busy remaking itself. See the map of their journey and photos, including those from their stop in Columbus, at ourtownsbook.com. JAMES FALLOWS has been a national correspondent for The Atlantic for more than 35 years, reporting from China, Japan, Southeast Asia, Europe and across the United States. He is the author of 11 previous books. His work has also appeared in many other magazines and as public-radio commentaries since the 1980s. He has won a National Book Award and a National Magazine Award. For two years he was President Jimmy Carter’s chief speechwriter. DEBORAH FALLOWS is a linguist and writer who holds a PhD in theoretical linguistics and is the author of two previous books. She has written for The Atlantic, National Geographic, Slate,The New York Times and The Washington Monthly, and has worked at the Pew Research Center, Oxygen Media and Georgetown University.